If you want GPU support you can install nvidia-docker along with docker or install udocker instead of docker. udocker is entirely a user tool, i.e. it can be installed and used without any root priveledges, e.g. in a user environment at HPC cluster. To access the downloaded module via API, direct your web browser to http://127.0.0.1:5000. If you are training a model, you can go to http://127.0.0.1:6006 to monitor the training progress (if such monitoring is available for the model). For more details on particular models, please, read model documentation. Using Github way allows to modify the Dockerfile for including additional packages, for example. $ docker build -t deephdc/deep-oc-module_of_interest . One can also clone the source code of the module, usually located in the ‘module_of_interest’ repository. oidc-agent installed and configured for DEEP-IAM (see rclone howto). In order to submit your job to DEEP Pilot Infrastructure one has to create TOSCA YAML file. 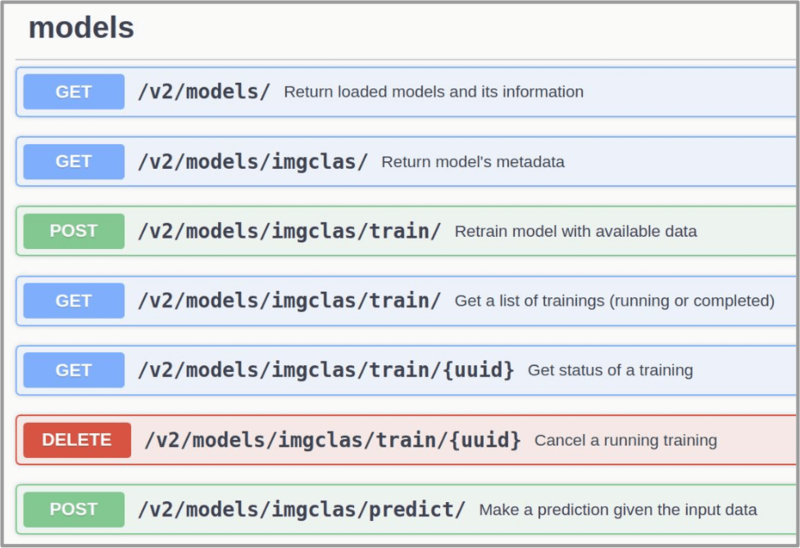 The DEEPaaS API enables a user friendly interaction with the underlying Deep Learning modules and can be used both for training models and doing inference with the services. Check the full API guide for the detailed info. The integration with the API is based on the definition of entrypoints to the model and the creation of standard API methods (eg. train, predict, etc). An easy way to integrate your model with the API and create Dockerfiles for building the Docker image is to use our DEEP DS template when developing your model. © Copyright 2018, DEEP-Hybrid-DataCloud consortium Revision 0844c69a.